I went through a shirt-cutting phase last year where I cut all (literally ALL) of my t-shirts into workout shirts…and as a result, pretty much all my workout tops look the same. 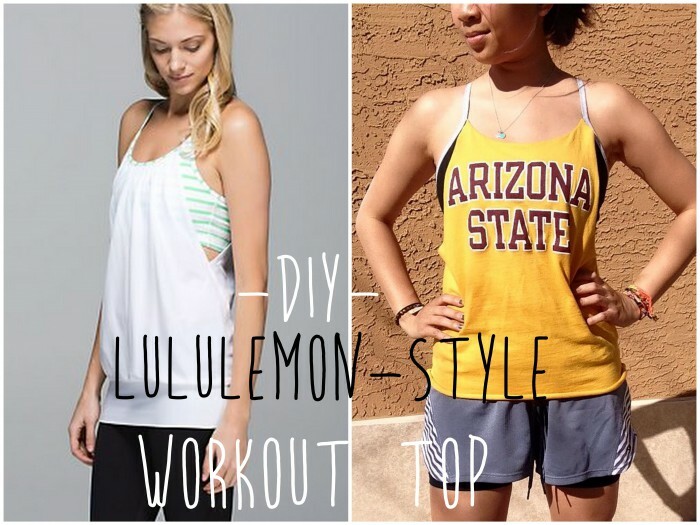 I’ve been seeing this new workout-top style a lot lately, and decided to give it a try before splurging on Lululemon. 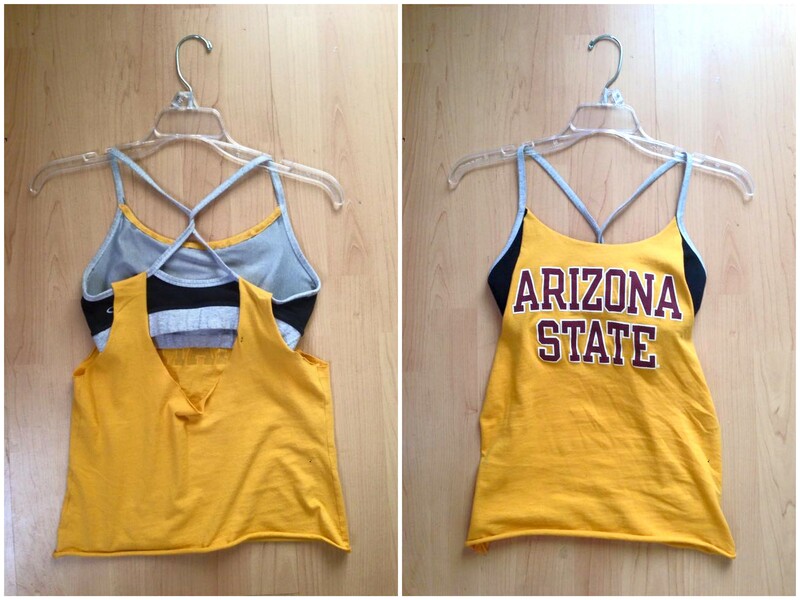 I used one of my old college shirts and and a sports bra that I didn’t mind ruining if it didn’t turn out right. The shirt I used was a fitted tee, but a loose-fitting shirt would work fine as well. You’ll also need fabric glue. I did do a small amount of sewing, but you can definitely just stick with fabric glue if you prefer. 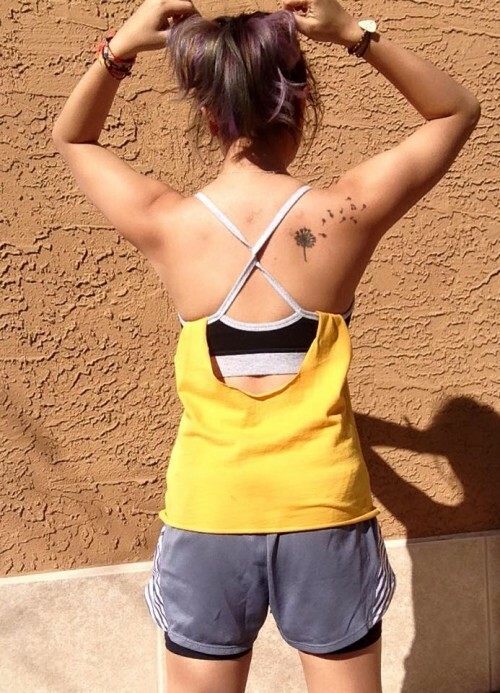 First thing is to cut off the sleeves and collar so that you have a tank top (keep the straps thick), then cut the strap at the shoulder so the top no longer connects at the shoulders. 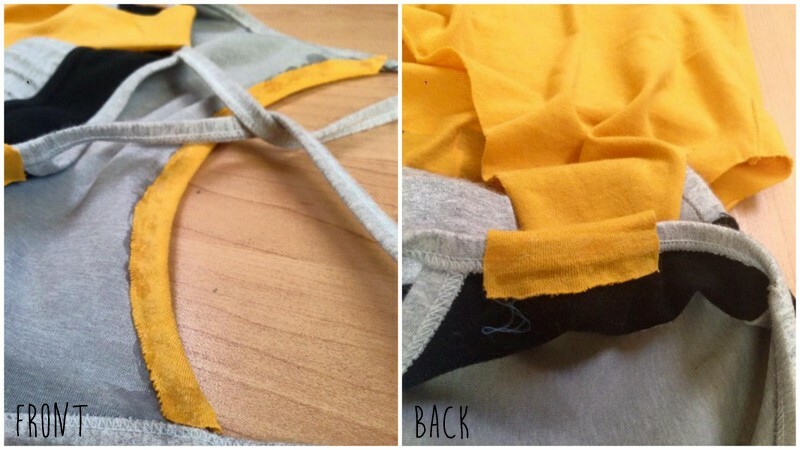 Next, place your bra in your tee and measure where to glue/sew them together. I ended up cutting more of the collar off so it fit the shape of front of the bra. For the front: The front of the shirt will fold over onto the inside of the bra. I used fabric glue here, and then put a heavy book over it for a couple hours to make sure it stuck. The final result has a cool-looking back cutout and open sides. It’s not exactly like the original, but I gotta say I’m pretty happy with how it turned out! Plus, having both the bra and top together just makes life easier (anyone else have trouble choosing the right workout top and sports bra combo?). ‹ PreviousBEST Almond Cinnamon Coffee Cake yet! Next ›Rearranging my living room! Awesome! You are so creative. I love chopping up t-shirts. The beauty is you don’t have to see the edges! Great top! So true – the imperfections make the look sometimes!! Glad you like.